“Whatcha gonna do with all that junk, all that junk inside your trunk?” We’re not totally sure what the Black Eyed Peas were branding on about in the bafflingly cretinous My Humps song, but we can only assume they were addressing an acquaintance who’d been deeply entrenched in the painstaking task of clearing out the loft, sorting and pruning and expunging until the boot of their car was full of superfluous items from their past. Unwarranted quizzing from average rappers aside, this kind of endeavour is all just part of life when you own an estate car. Well, unless you’re Sander Op’t Root, that is. He’s the owner of this particular car, you see, and there are two important elements in his sphere of experience which exempt him from having annoying refuse-based badinage with terrible musicians. First of all, it’s a BMW, which means it’s not an estate – it’s a Touring. And secondly… well, just look at the bloody thing. This is clearly not a man who bought an estate car so he could cart the lawn trimmings about or take advantage of the offers on home furnishings at Habitat. It’s immediately obvious that this is a man with vision. Someone who would rather create his own bow wave in the scene than bob and eddy in the turbulence of others. And inspiration for the first alteration came From his brother – or, more specifically, his brother’s car, a bagged Passat. Sander coveted that air-ride, he wanted it for himself. 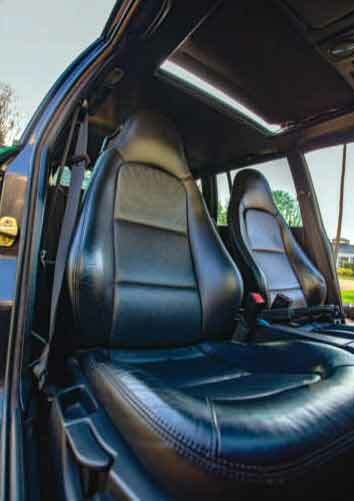 This lust plunged him headfirst into the adventure he so yearned for right from the get-go, as air-ride is a), quite expensive to buy, and b), not readily available for the E30 Touring. So the only realistic option was to fabricate a bespoke system. Thankfully, Sander relishes this kind of thing, like a mad scientist after a boozy lunch. “I first set about finding some appropriate air-bags, and then sourced some valves I thought would work well,” he says (slightly manically, but all the more endearing for it). “After a bit of fabrication I got it all installed and working properly, and the acid test was to get out and try to drive it as low as possible. Which was a mistake, as it turned out, as the bags then fouled the wheels and split open. Everything broke.” But this is all part of the fun, isn’t it? Being a trailblazer isn’t easy. Sander simply dialled a mate to tow him home, installed a new set of bags and this time fitted an electric valve regulator. Bit of trial and error, but it all turned out lovely in the end. As it turned out, it wasn’t just any bodykit that he had his eye on, but the muchrevered and drooled-over Pandem kit – developed by Rocket Bunny for the E30 saloon, which Sander sought to cunningly rework to fit. While he was busy with the measuring tape, he also figured out he’d be wanting some truly fat wheels to fill out the new corners. So he set about searching for such things on the interweb. In due course, the ideal set was found – a refreshingly wacky quartet of Carline three-piece splits, rich in old-school Center Line-style shininess, and at 10.5-inches wide they seemed like they’d be girthsome enough to satisfy. However, it transpired he’d need to go even wider. 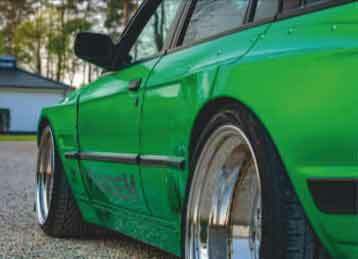 He simply grabbed a broader set of lips and rebuilt the wheels to be even meatier. And so came the fitting of the bodykit Something not for the faint of heart. “I procrastinated for days, because I knew once you start grinding away at that metal there’s no way back,” he grins. Sander cracked out the power tools and got busy. After much trial-fitting, tweaking, metal trimming, he was eventually able to step back and gaze upon his magnificently loopy creation. 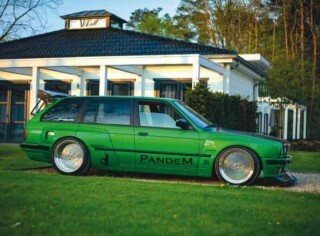 Possibly the least sensible estate car the world has ever seen. 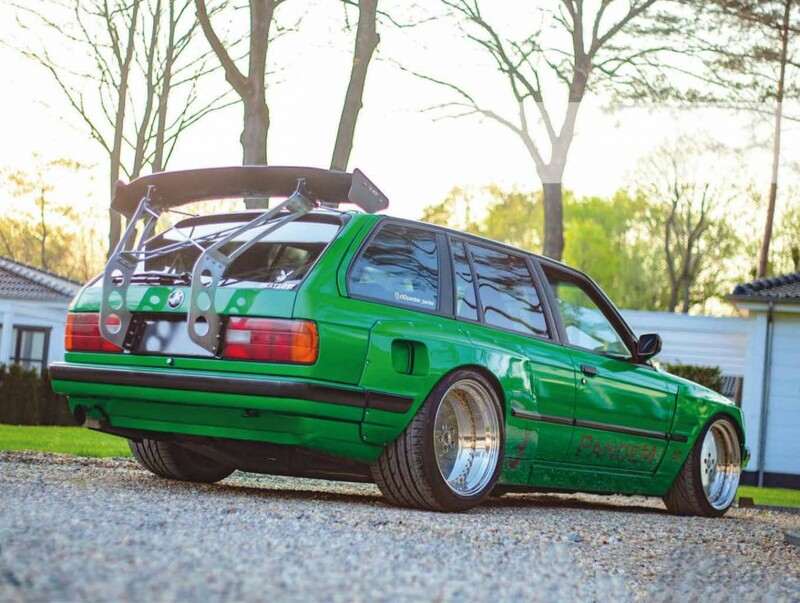 The addition of the custom rear spoiler really adds to the lunacy; a unique setup by General Wheels, it was made-to-measure for the Touring and exudes a rich Touring Car vibe. Substantial-looking bit of kit, isn’t it? “After many weeks of welding and grinding and polishing, over and over again, the entire Pandem was done and it was ready to go for its roadworthiness inspection,” he says. “There was a problem in that the regulations state the doors have to be able to be opened from both inside and outside. And of course the new rear arches cover up where the old door handles would have been. After a lot of thinking, I fitted some door-popper buttons under the wings so you can open them from outside.” Ingenious, huh? This bizarre car just keeps on serving up wonderful surprises. 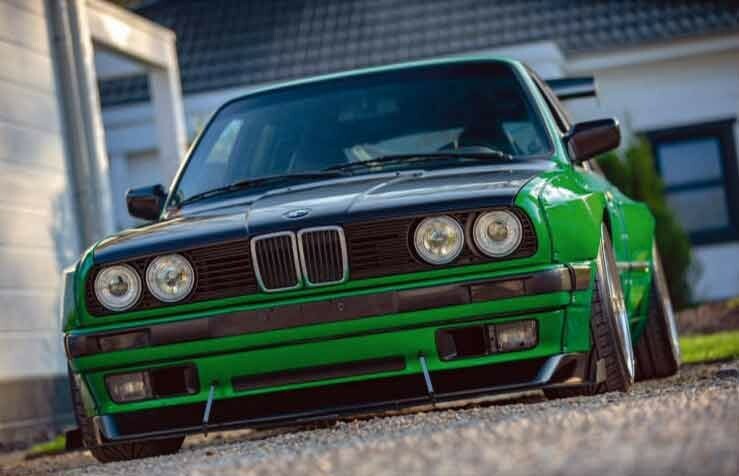 “You don’t see a lot of E30 Tourings at car shows,” Sander ponders, eyeballing his meisterwerk with the expression of someone who’s sown the wind and just realised he’s now about to reap the whirlwind. And he’s right, you don’t, and you’ll never, ever see one as mad as this. As the perennially befuddling Black Eyed Peas would put it, “I’m a get get get get you drunk, get you love-drunk off my hump.” And no, we’ve got no idea what that means either. But it’s approximately just as mental as this E30 Touring. 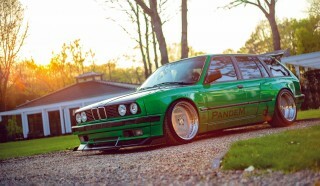 Styling Pandem widebody kit; custom green wrap; custom General Wheels rear spoiler; E36 front splitter with M3 lip. Tuning M50B25 2.5-litre straight-six; custom exhaust manifold and 3in exhaust system; 5-speed manual. Chassis 18in Carline 3-piece split-rims; 245/35 Toyo T1-R tyres; home-made custom air-ride setup. Interior Z3 front seats; QSP steering wheel; MTX component speakers and amp; 2x 10in Ascendant Audio subwoofers with 3500rms amp. Thanks To Byba Kits; WrapJunkies and Sten Bosch; General Wheels; and Marco Op’t Root. We’re certainly feeling green with envy. 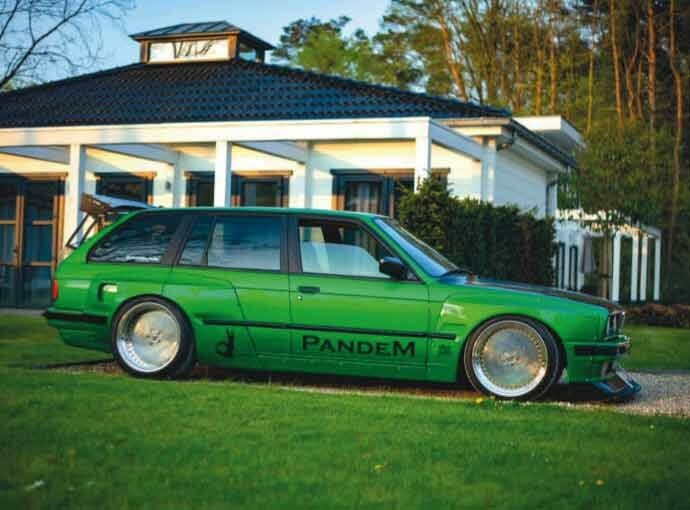 Pandem widebody kit, custom green wrap and custom General Wheels rear spoiler. Front seats courtesy of a BMW Z3. Inspiration for this project: I saw a Pandem E30 coupe from America on Instagram and fell in love Which part took the longest? 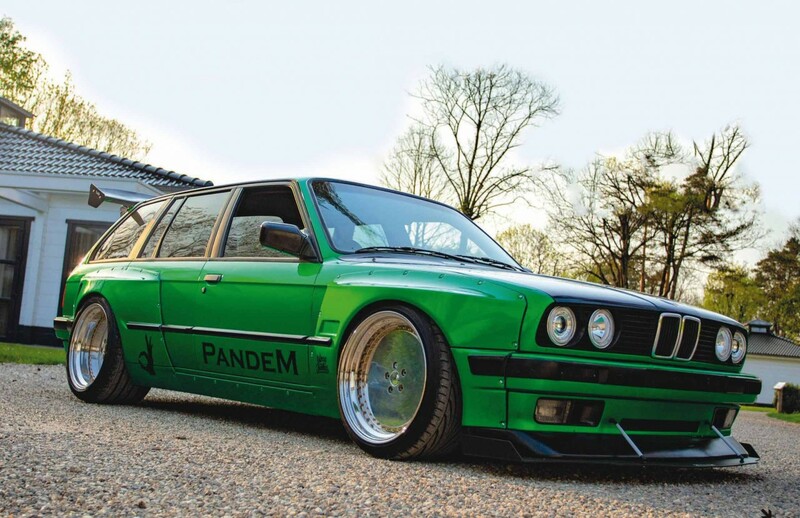 The bodykit build, definitely Favourite thing about your car: It’s a Pandem Touring! Rocket Bunny’s Pandem sub-brand has seen Kei Miura’s iconic brand achieve colossal global success, with their ever-expanding range of widebody kits catering for far more than just Japanese domestic models. You can even get a Pandem kit for a Mk2 VW Golf! 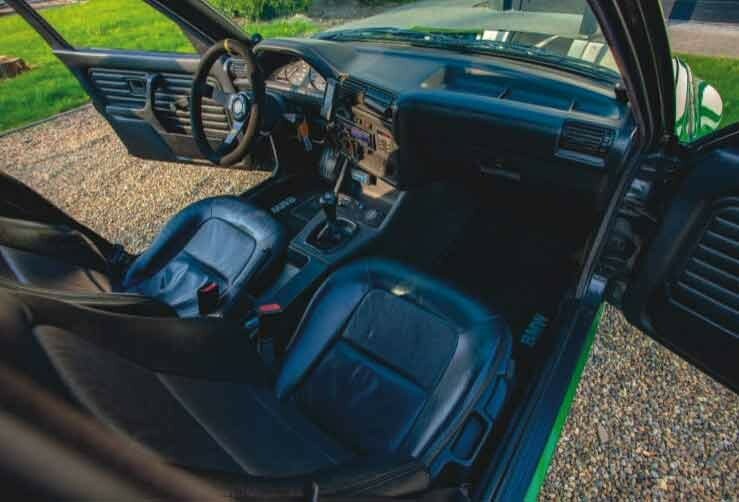 And it was a bit of a no-brainer for the company to design and manufacture a kit for the E30-generation BMW, given the model’s massive popularity these days. The kits can be bought off -the-shelf comprising front and rear wide arches, skirts, front lip and rear wing, all guaranteeing perfect fitment thanks to Miura’s fastidious laser-scanning. The only problem here for Sander was that the E30 kit’s made for saloons, not estates… But as you can see, this problem didn’t slow him down for long!